One of the first places to visit during my strolls through Perpignan yesterday afternoon [16 May 2018] was the Cathédrale St-Jean, with its Gothic architecture, its wrought-iron bell tower and its cloistered cemetery. The cathedral began life as a collegiate church, the Collégiale Saint-Jean, or Collegiate Church of Saint Jean. However, when the short-lived Kingdom of Majorca moved its capital to Perpignan in 1276, the Kings of Majorca wanted a more impressive church for their new capital. The original collegiate church had proved too small and King Sancho II of Majorca set about building a new church. 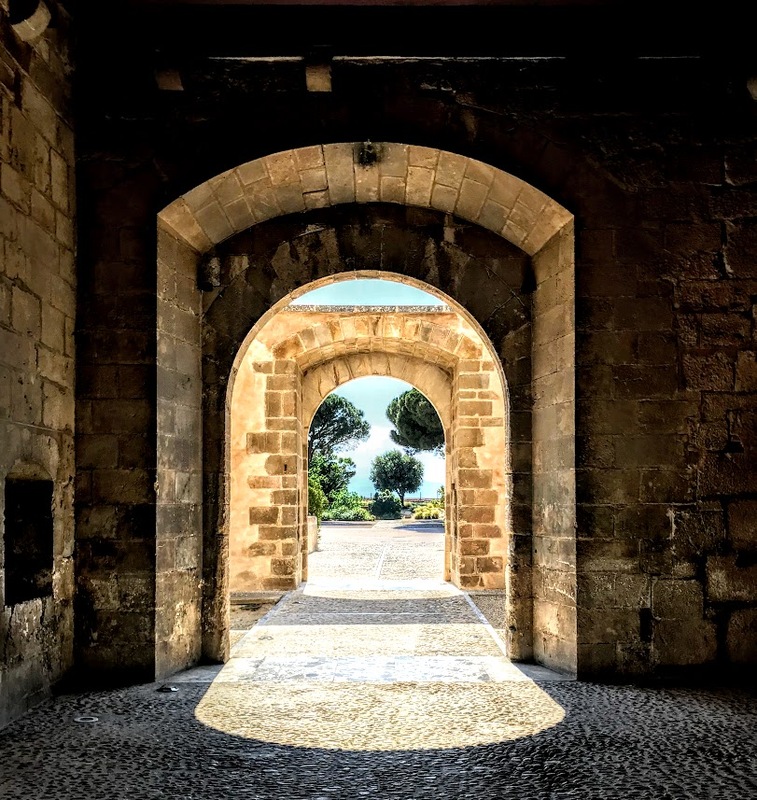 At the time, the Palace of the Kings of Majorca was being built as a new royal residence on a hill to the south of the city. King Sancha of Majorca laid the cornerstone when building work began in 1324. 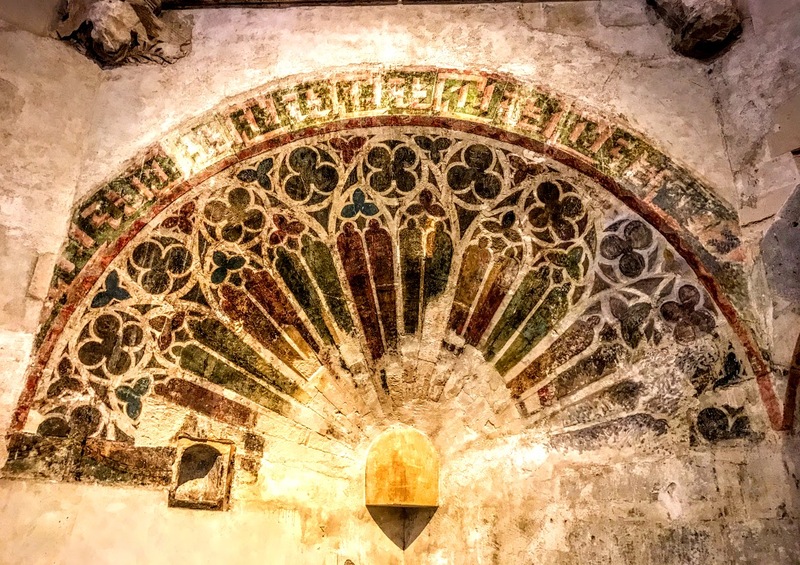 The original vision was for a grand, three-nave building, but only the choir was completed when the ‘forgotten and ephemeral’ Kingdom of Majorca collapsed in 1349 and the building project was interrupted. Benedict XIII, the anti-pope based in Avignon, fled to Perpignan and tried without success to rally his supporters at a council here in 1409. Further efforts to resume building works were disrupted by the plague and various wars, and building at St-Jean did not resume in earnest until later in the 15th century. 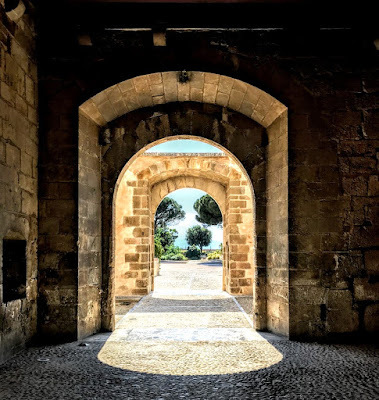 When the new building project was set on foot, Guillem Sagrera (1380-1456) of Majorca, one of the great architects of the times, took control of the project. A native of Felanitx in Majorca, Segrara’s masterworks include La Seu Cathedral and the Llotja dels Mercaders (1426-1447) in Palma de Majorca. 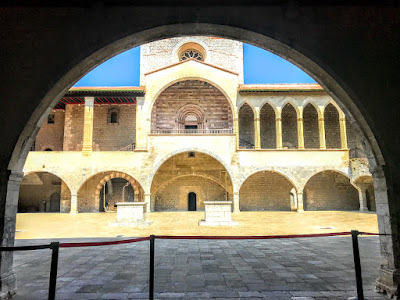 He also worked at the court of King Alfonso V of Aragon in Naples, where he restored the Castel Nuovo, redesigning its plan and adding several loggias and the Barons’ Hall. 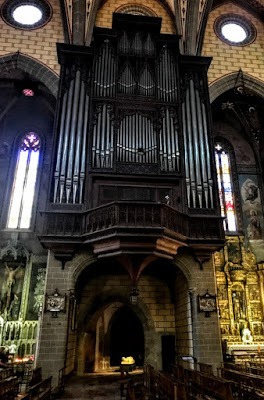 In Perpignan, Sagrera decided on a church in the Catalan Gothic style, with one nave of vast dimensions, and redesigned St-Jean in Perpignan in the same style as La Seu Cathedral of Palma de Majorca. Sagrera died in 1456 in Naples. The vaulting in Perpignan was not completed until 1490 and the church was not completed until the end of the 15th century. The pebbled façade with brick foundations remained unfinished, and the new church was only consecrated in 1509. 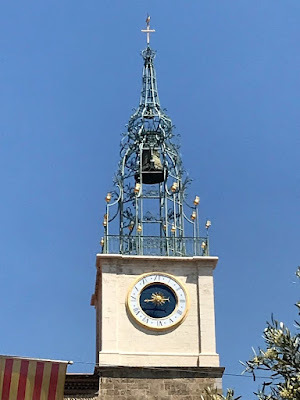 Originally, the diocese was based in Elne, but the new church replaced the Cathedral of Elne when the bishop was moved to Perpignan, and from 1602 the bishops held the title of Bishop of Perpignan-Elne. The cathedral’s western façade is a typically Catalan façade of pebble and brick, but it was never finished. The porch was added in 1631, the only remnant of a larger monumental ensemble. Philippe Barthélemy added the wrought-iron campanile in 1743. 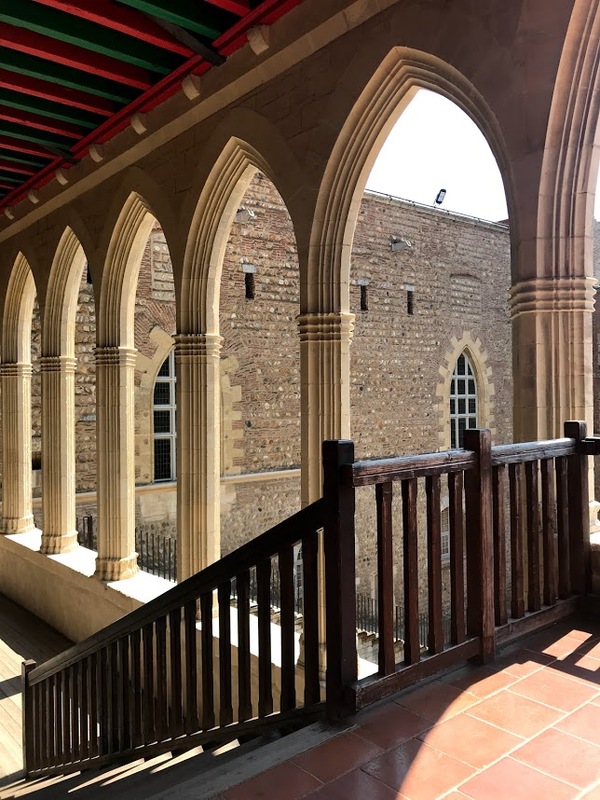 When the cathedral was restored in the 19th and 20th centuries, the Gothic window of the façade was rebuilt, as it had previously been substituted with a simple rectangular opening. The interior of the cathedral gives an impression of unity due to the harmonious proportions and the imposing character of the nave. 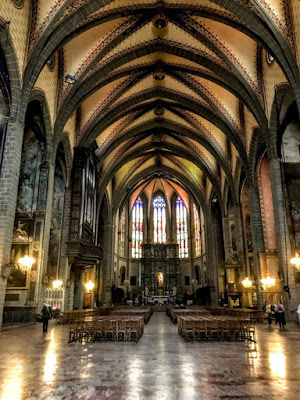 This impressive nave is 80 meters long, 18 metres wide, and 26 metres tall. It is built with seven cross-vaults and has short transepts and a short apse. There are magnificent Catalan, Gothic and Renaissance altar pieces in the side chapels and the treasures include le Dévot Crucifix, a 14th century wooden sculpture. Some of the side chapels incorporate parts of an earlier Romanesque church. These chapels include the 15th century chapel dedicated to Notre-Dame-de-la-Mangrana, and the Chapel of Saint Eulalie and Saint Julie, patron saints of the diocese, which was painted by Jean-Jacques Melair in 1676. One of the side chapels includes the painted remains of the original organ case. 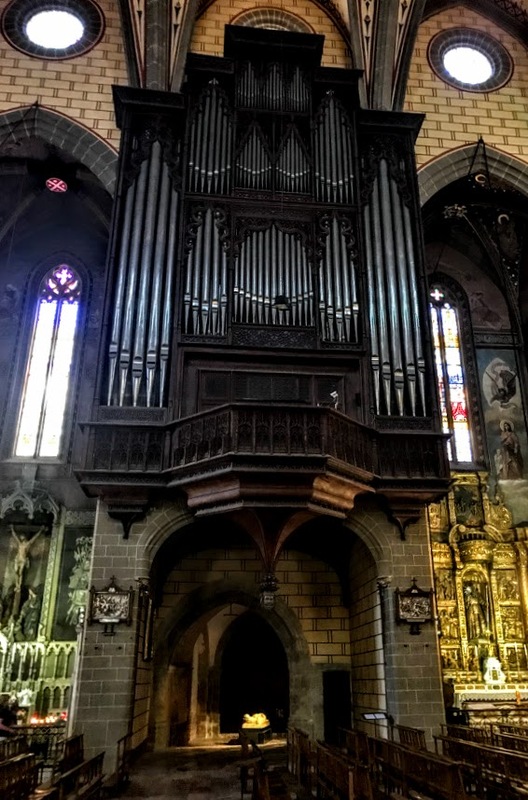 The elaborate furniture in the cathedral includes some real masterpieces, and the organ is listed as an historical monument. On the south side of the cathedral, the cloister-cemetery of Saint John, or Campo Santo, dates from the early 14th century and is one of the oldest mediaeval cemeteries in France. The cloister galleries were covered by a sloping roof supported by columns with sculpted capitals. 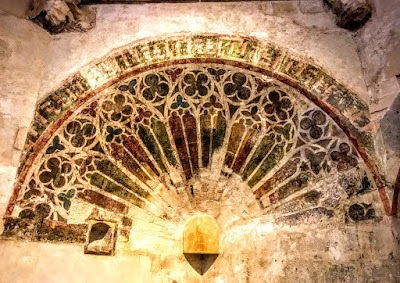 Each funeral niche or recess, with a refined gothic design, is marked with heraldic shields bearing the coats-of-arms of the ruling and noble families of Perpignan. 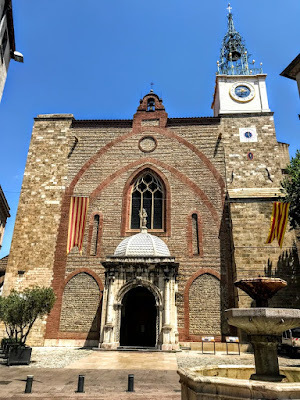 The Palace of the Kings of Majorca (Palais des Rois de Majorque), with its fortress, crenelated towers, gardens, chapels, courtyards and horseshoe-shaped arches, stands above the city of Perpignan. Two of us climbed up through the city streets yesterday afternoon [16 May 2018] to this star-shaped gothic fortress, with its panoramic views across the Roussillon plain, out to the Pyrennes mountains and down onto the terracotta roofs of the city below. The forgotten Kingdom of Majorca existed for just seven or eight decades, from 1270 to 1349. Because of its short span and its sudden eclipse, the Kingdom of Majorca might easily be forgotten today. Indeed, Olivier Poisson has described it as the ‘forgotten and ephemeral monarchy’ of Majorca. But the Kings of Majorca had palaces in Palma de Majorca, Almadaina and Belver, and Perpignan was strategically placed between the competing interests of the monarchies of France and Spain, and close to the continuing threats from Arab rulers in the Iberian Peninsula and across the Mediterranean. The kingdom included the Balearic Islands – Majorca, Menorca, Ibiza and Formentera – as well the counties of Roussillon and Cerdanya and the territories that James I had kept in Occitania, the signory of Montpellier, the viscountcy of Carlat, in Auvergne, and the barony of Aumelas, in the area of Montpellier. King James II of Majorca made Perpignan the capital of his kingdom in 1276, and Perpignan became an economic, politic and cultural centre in the Mediterranean during the Middle Age. When James II began building his palace with gardens on the hill of Puig del Rey on the south of the Perpignan, it was arguably the most exciting period in the building programmes of European mediaeval monarchs, what was ‘the triumph of the Gothic.’ His architects were Ramon Pau, Pons Descoyl and Bernat Quer, and the castle was completed in 1309. When James III was defeated and killed at the Battle of Llucmajor in 1349, and the Kingdom of Majorca was incorporated into the Kingdom of Aragon. Almost a century later, the Palace of Perpignan was at the centre of efforts to heal the schism in the western church. The grossly anti-semitic Pope Benedict XIII, who is now regarded as an anti-pope, was one of the popes based in Avignon. But when he lost the support of France he was driven out of Avignon, and in 1408 he was forced to seek refuge in Perpignan and the protection of the Kings of Aragon. The Holy Roman Emperor, Sigismund of Luxemburg, organised a European summit in Perpignan in 1415, in an effort to convince Benedict XIII to resign his office and put to an end the Western Schism at the Council of Constance. The Emperor met Pope Benedict XIII at the palace in Perpignan on 20 September 1415. The council was also attended by King Ferdinand I of Aragon, delegations of the Counts of Foix, Provence, Savoy, Lorraine, the embassy of the Roman Church representing the Council of Constance, and embassies from the Kings of France, England, Hungary, Castile and Navarre. The other claimants to the Papacy had resigned, but Pope Benedict XIII refused to resign or to recognise the Council of Constance. Eventually, the emperor left Perpignan on 5 November. Because of his stubbornness, the Council of Constance declared Benedict a schismatic and excommunicated him on 27 July 1417. The council went on to elect Martin V as the new pope on 11 November 1417. Benedict, who had lived in Perpignan from 1408 to 1417, now fled to the Peniscola Castle, near Tortosa, in Aragon. He still considered himself the true Pope, but he was recognised only in Aragon. He died at Peñíscola on 23 May 1423. Perpignan was held by the Kings of Aragon until 1462, when the Palace was captured by the French. It was used as a barracks for three decades in the late 15th century. The Spanish recovered Perpignan in 1493, and further changes were to the palace by Emperor Charles V, Philip II and their successors. The Palace finally came back into French hands when the Treaty of the Pyrenees was signed in 1659. From then on it was a military barracks, and the significant French extensions included the massive red-brick walls built as fortifications by Louis XIV’s military engineer, Sébastien Le Prestre de Vauban (1633-1707). The General Council of the Pyrénées-Orientales bought the Palace and the gardens in 1958 from the French Ministry of Defence, although the Vauban bastions and the 19th century buildings and courts remain a garrison. The Palace of the Kings of Majorca has two chapels, one above the other: the lower is known as the Queen’s Chapel, while the upper chapel, the Chapel of the Holy Cross, has a pink marble Romanesque door. The upper level includes the Great Hall, which was the seat of political power, the chapel and the royal residence. The position of the chapels in the heart the royal apartments, opposite the throne room, indicates the importance of the spiritual over the temporal. The plan of the palace was inspired by those of Majorca, and the main chapel has been compared with the earlier Sainte-Chapelle in Paris. The walls are built with uncut stones and bricks bound with mortar, were coated with lime and painted. The doors, corridors, stairs and the main towers are all made of cut stone: ochre stone from Les Fonts, Baixas blue, sandstone, red marble from Villefranche-de-Conflent, and white and blue Marble from Ceret. The benign neglect during centuries of French military control meant that much of the original architectural work of the palace was preserved. After the fall of France in 1942, and with Spain ruled by fascists, the buildings no longer had military significance. The palace was handed over to the local government of the Pyrénées Orientales. A programme of repair and restoration began, and was completed by the local socialist mayor, a former member of the Resistance at the end of the 1940s. The restored buildings were opened to the public in 1958. A free, three-day guitar music festival, the Guitares au Palais, is held in the Palace and the gardens each year in the last weekend of August. The programme includes traditional acoustic guitar, flamenco, classical music, gypsy music, pop music and jazz. RESPOND … with prayer and action. Oh revealing God, as we stand transfixed in an unexpected place, crumpled and surprised to find ourselves here, invited, yet uncertain on the threshold, help us to recognise our gorgeous Lord Jesus. Drawn in, may we kneel in wonder. May we go away changed. May we draw others to the stable too.